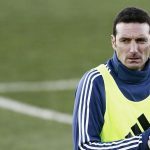 Ahead of his team’s friendly match against Colombia, Argentina coach Lionel SCALONI spoke at a press conference about a number of topics. “There are a few doubts still in the team. We will see how Angel CORREA is doing. “Beyond the opponent, we have our own idea. I’d like to stress that the changes we make are not due to a bad performance. We are very happy with SIMEONE. In ICARDI’s case, we all need his goals. In regards to the starting goalkeeper, Franco ARMANI is expected to play the full 90 minutes. About having a squad which hasn’t played many matches with the Argentina National Team. “Anxiety is controlled by playing more matches. There are players that are 18 or 19 years old and are capable of handling anxiety, for that reason they are great players. “It’s obvious that when the best player in the world isn’t there on the pitch, most of all if he is Argentine, the team loses (something). “Out of the players which came, some kept the numbers they had at the World Cup. It (the number 10 shirt) is MESSI’s until he says if he will come back or not. We don’t have anything negative and for that we took the decision that no one uses it, but we will see in the future. Tata Martino is a good Coach but i don’t think he should be the one to lead us in a 10 year project. It could have been perfect for either Pochettino, Simeone or Gallardo. Well they don’t want to serve their country when needed i guess. Someone younger has to be trusted. results will come gradually only. AFA will change Scaloni. So that’s that. At this point Scaloni is better than Tata. A Logical thinking Coach. young too. There won’t any of Pochettino, Simeone or even Gallardo. Forget about them. The first two won’t leave their club for AFA shithole and the third has a very poor relationship with Angelici. They had Gareca who offered himself politely a month ago and it was a realistic option. But the numbskulls at AFA shruged him off. As a result now they are looking at Martino as a desperate measure because they know they won’t get the three names always mentioned. Complete imbeciles at AFA. Yupp Gareca would have been better. The Sad part is after all this meetings and plannings they r gonna take Tata?? Well as of now this is a Rumor. But unfortunately Tata is Tapia’s friend. Tata is a proven failure for us, Again saying he is good coach. But he is not what we want now. As per me. I really hope Scaloni impresses for next 4 months. I liked this. Except RB, Saravia is in my understanding a better defender than Bustos. Bustos is better ball provider n mover, but against a wing attacking team like Columbia, i will trust Saravia more. Think the same. Saravia better defensively. Paredes was our the most important midfielder in last game. He is our only midfielder who can play long passes. He can pick up wingers with long passes which create dangerous situations. Not to mention, his excellent corners and free kicks. Our creativity instantly lessned when he was subbed off. He is a must. Yup, Its been long time we have been craveing for someone like him. Banega or Biglia never consistently cut the cake. I hope Paredes keep adding minutes and be our Anchor for long time. He’s the only defensive minded midfielder that we got who has creativity in him. I’m eager to see him play against a team that presses him. May be pairing him with Lo Celso and Battaglia will yield the best result. As I have said countless times – Fix the midfield and our problems will be solved. And midfield means Central Midfield. Not attacking midfield or Defensive midfield, Central Midfield! At least one of Paredes/ Lo Celso must play every game to see more creativity in the team (it depends on attacking forces of opponent). ThoughI don’t see themso much creative and full of initiative along with Messi if he will back. When or If Messi comes back every one will turn from Manual Mode to Auto Mode.That will again happen no matter who all r selected. Cant blame them too they r going for the easier option, Which is Just pass to Messi, Rest he will do. Oh, that’s great metaphore. Sad, correct and true at the same time. I hope Pity Martinez gets another run in. In a different position this time. Angel Correa is a “very very poor man’s Tevez”. I hope he proves me wrong but even after 5 years in Europe he has hardly convinced me. I wouldn’t mind keeping Scaloni as the permanent coach. He seems to have the common sense that Sampa so clearly missed. What would for instance Pekerman bring that Scaloni has not already done? And appointing Tata would be the craziest thing of all. By that logic, Sampa may return by 2021. Agree, Why not just give Scaloni the benefit of the doubt. For the project to succeed We need stability and continuity. We should have won in 2006. I am for a young coach, Gallardo style. I have good expectations of Scaloni, I think he can manage to give us a good team. We just have to give him time. 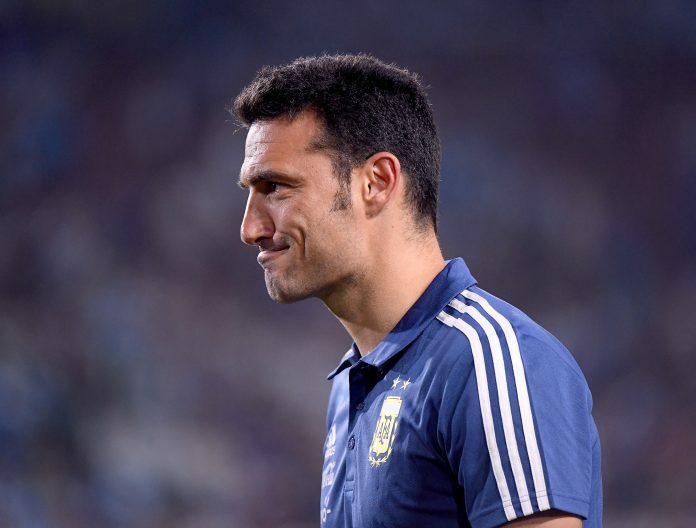 He cares about his project, I am sure it was not just Messi that refused a call up to the NT, I don’t think Scaloni ignored all of the old squad, but it seems that they all declined to give time for the team to have fresh blood after their failure in the past WC. We don’t need big name coach now. You guys have to stop fantasizing about Simeone or any high profile coach from Europe, They will not leave their high paying jobs and come to this corrupt AFA. Those coaches will not come to start a big project that will pay off in years and destroy their reputation in the process. 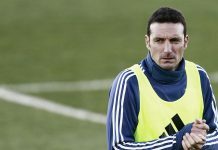 I think from following Scaloni’s style, He is attack minded and cautious in the back and that’s what we need, a smart coach who can pay attention to all lines(defense, midfield,attack). Let’s wait and see. too defensive it won’t suit the NT. Simeone always prefers 4 4 2 formation, He mastered the tactics of this formation with discipline and cohesiveness. He demands that every player contributes to the defensive and pressing modes of the match, he likes attacking and defending as a unit to keep the ground covered. As far As I’ve seen he is the best coach who plays 4 4 2 in history. When Atletico is under attack the defense falls back and the team compresses narrow to close the midfield, that forces the opponents into playing at the wings where they are constantly pressured to lose possession and quickly launch a counter attack. This style will not work for Argentina as our strength was always in the forwards. We better play 4 2 3 1 with 3 attacking midfielders who can act as strikers too. I am an Atletico Madrid fan since 85, I have seen how Simeone transformed this team from nothing into one of the European giants. This guy lives like a king in Madrid, and he won’t be coming home now. I am sure that one day he will definitely coach Argentina. Believe it or not, HE was available after the 2014 WC, but The AFA ignored him. Pekerman is and always will be a loser when it cines to coachinh proper grown up teams. This is a guy who if by some miracle managed a team that got to a world cup final and that team was 6 nil up in the 89th minute, he would find some way to lose 6-7. I’m glad that Palacios may force his way into the starting lineup. 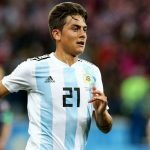 He would provide more stability and composure in the centre compared to Dybala who is more erratic and loses the ball more easily. Let’s see how this goes. Another person i’m looking forward to seeing is Angel Correa. Really hope he’s given some minutes despite his condition. News circulating that Tata Martino will be the Coach in January. 1) We already been down that road and even though he wasn’t bad to be honest but his refusal to use younger players in certain positions when certain vets. couldn’t cut it anymore cost the team probably the two Copas. 2) Him and the AFA did not part on good terms. 3) He has had great success coaching Atlanta United, going from an expansion team in less than 2 years to one of the elite clubs in MLS, they love him, I know, I live here. Plenty of money, first class stadium and organization …whats not to like? It is Tata Martino who refused to invite young players after the 2014 World Cup. And its because he didn’t, Sampaoli didnt have any time. Even then, Sampaoli introduced some new players. Tata Martino is partly the reason we had a Mascherano Biglia midfield prior to 2018 world Cup. I’d even welcome Pekerman before Tata. He’ll have to incorporate youngsters…we cant progress 1 foot forward but then take 2 steps back. With Tata, i thought we played beautiful futbol, possession with a purpose, from build up to final attack, the team looked great some matches. Of all the coaches in the past decade, i think he leveraged our attack the best. not sure who can do a better job at this point…unless the untouchable decide to leave england and spain. I also dont know how hell get past the past financial dispute with AFA, maybe money will talk and hell overlook it. The team under his control blew hot and cold. It was either they won by 2-3 goals or barely winning/losing. That first Copa could have gone either way but NO EXCUSES for the 2nd. agreed. and some subs were poor choices. I can understand that because afa re broke…. Goddammit, wish it’s only rumors, Hope the fears don’t come true. It’s understandable Tagliafico replacing Acuna. 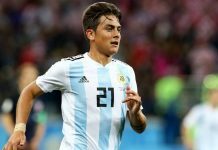 Tagliafico deserves to start every matches for Argentina..Acuna at LB role is not a great idea. But in my opinion Acuna is a very important player for the squad. His versatility in left flank, ability to defend & his skills in attack, are valuable to the team. He’s not an easy midfielder to play against. He always make it difficult for opponents with his club and contribute big to his club. He’s very consistent as well. I hope & pray, Today will be that day in which Icardi owns the No 9, finally. I’m sure the boys will play with all energy & spirit today. We shifting to a regular 4_2_3_1 set up is something encouraging to see. On last training Palacios had played instead of Dybala. I wonder what the heck is going on with Dybala. Hope it’s just a blip. Good thing Palacios did well, excited to see him develop.